10 x € 135.10 / mėn. ? The new SP 70-200mm f/2.8 G2 (Model A025) telephoto lens reimagines the highly acclaimed Model A009 with enhanced optical performance, improved VC (Vibration Compensation), faster AF speed and accuracy, and shortened MOD (Minimum Object Distance) for greater flexibility. What’s more, compatibility with Tamron tele converters provides additional focal length. Improvements to the new SP 70-200mm f/2.8 G2 extend well into the lens barrel. 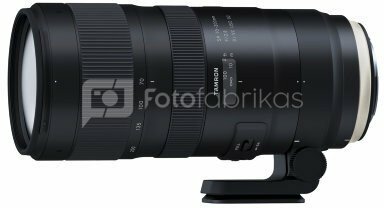 Tamron has reduced the MOD from 1.3m in our older model to 0.95m, allowing a maximum magnification ratio of 1:6.1. The shorter MOD, coupled with the superb optical performance of this new zoom, allows you to significantly broaden your range of expression. Tamron’s best-in-class VC image stabilization performance is equivalent to 5 stops, according to CIPA standards. Plus, this lens offers a choice of three VC modes, including one exclusively for panning. Now you can match the VC mode to your shooting conditions and enjoy sharp, jitter-free handheld shooting—even in low light.